As a worldschooling family, teaching duties mainly fall to Suewan, as you’d imagine with me working full time. But I do help where I can. And one of my roles is PE Teacher! As you may remember, I’ve got into running a lot more since leaving England. Especially in Valencia, which is a “running city” and perfect for taking your first steps. With that in mind, I decided it might be nice if I could get Roobs involved. She’s getting plenty of exercise with the amount of walking we do, but there’s nothing like a challenge to really get you going. And I was a little worried that she’d be missing out without any competitive PE, so I figured it would be good for her (and us). So, I thought – why not set a 1k challenge? I had no idea whether she could even run 1km (that’s 1,000 metres / 0.6 miles). And if she could, I couldn’t guess how long it would take. 10 minutes maybe? At first I really didn’t want to go but my daddy said “give it a try” and he said if you do it you can have a sweetie. Now that was different! “Ok I’ll do it” I said. Roobs was very reticent at first. I asked her a few times but she was not particularly interested. Sometimes we go with what she wants but there are times as a father (and teacher) when you have to push her. This was one of those times. So we headed out one Saturday morning, despite the heat, and took a bus down to the dry river in Valencia. I explained to her there was no pressure, we’d just see how she got on. I promised her that she’d get a sweet this time. And I set her a challenge – she’d get a sweet any time she beat her best 1k time! She was feeling a bit nervous. I kept explaining that she shouldn’t sprint, just a light jog would do, and if she needed to walk that would be ok. The river is flat so it’s great for running, and it also has markers every 100m so you know where you are. 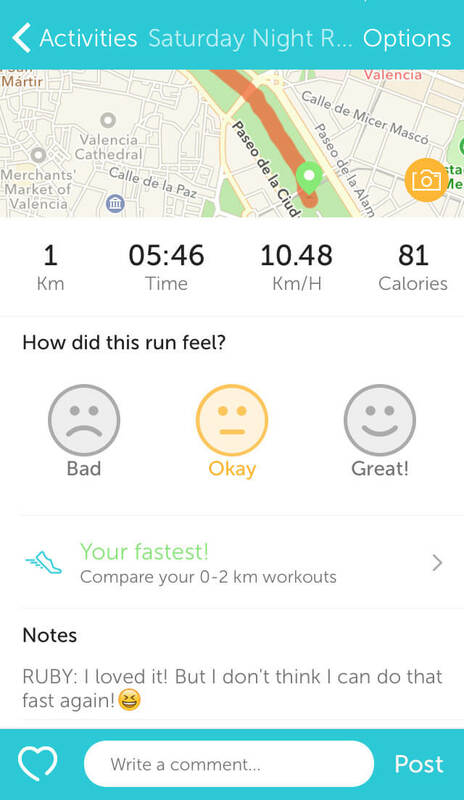 We found a marker, and set off – me tracking the run with the RunKeeper app on my phone. Roobs found her pace quite well – it was slow and steady. At one point she said she wanted to stop but I just told her to slow down (anything but stop!). 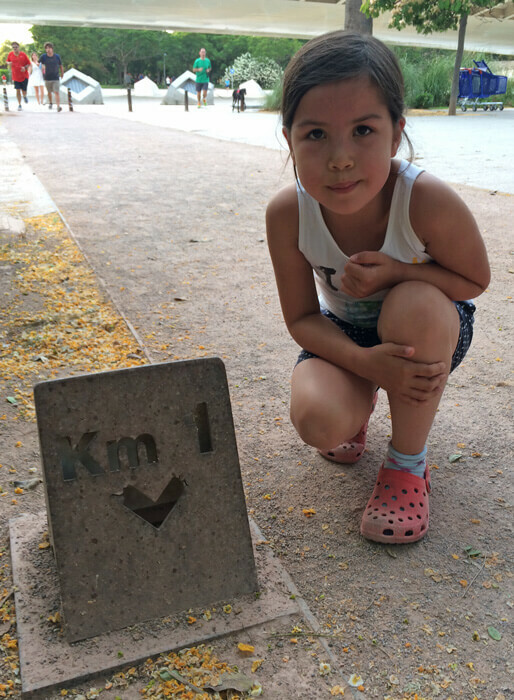 Her first 1km took 8 minutes and 7 seconds. We sat down and she got her breath back. I was very proud of her and she seemed pleased with herself, but what she said next really surprised me! When we had done 1km I ended up saying to daddy that I loved it SO much that I wanted to do another 1k back! So I ended up running 2 kilometres. Apparently that was just a warm up! Now she’d shaken off the nerves – it seemed she was up for breaking her record straight away (must have been the lure of sweets). We set off again, back the way we came. Roobs pushed a lot harder, and she was ready this time to make a sprint for it in the last 20 metres. This time she posted 6 minutes 42 seconds. Way to smash your PB! 6:42 – Can’t believe I did it! Love it so much – want to go again every day. My legs feel stupid, like I need to put more weight on them. A couple of days later, we tried again. Roobs was a lot more relaxed this time, genuinely up for the challenge, and in her first 1k she posted 6 minutes 5 seconds! That’s over two minutes faster than her first run! 6:05: – I feel so tired but so happy I did it! By now I’m thinking – can she run under 6 minutes? For the record, I aim for under 6 minutes for each kilometre when I’m out on my 5k runs. So for the second 1k run, I’m talking her through it all the way, encouraging her, telling her with each 100m how far she’s gone, and how much is left. Roobs is really focused now – she very competitive and wants to beat her time. And when we get to the last 20m, she properly starts to sprint, it’s amazing. The time: 5 minutes 48 seconds! 5:48: – I am so happy that I don’t know what to say. All I can say is that I’m so puffed out I had a stitch and I had to push so much at the last bit I can barely move! I’m so proud of Roobs and how she’s embraced running. As I said, she’s very competitive and I like to see that in her. But we talked a lot about endurance and persevering even when you feel like giving up. A great lesson to learn and she respects it now she knows how it feels about 700m into a run! We ran one last time before we left Valencia. At this point I was worried there’d be no more sweets for her as she’d posted such a good time I couldn’t see how she was going to beat it. On our last run, we set off as normal and it felt like quite a steady run, like Roobs was more used to pacing herself now. She wound it up as best she could but came in at 5 minutes 53 seconds – just 5 seconds over her PB! 5:53 – I feel disappointed because I was so close to beating my old record. We got our breath back and set off again. It seemed to me that she had started too slowly – it was around 3 minutes at the halfway point. So I egged her on, making her push harder from about 800m onwards. We got to about 30m left and she saw the final 100m marker – and she took off! I don’t mind admitting that I struggled to keep up with her! She properly sprinted. The time… 5 minutes 46 seconds! She did it! That’s an impressive 10.48 km/h. It’s been a great experience running with Roobs. I’d love for her to develop this and maybe it could be something we enjoy doing together as she gets older. Sadly we haven’t done any more running since we got to Prague, but writing up this post has inspired me to get going again (although she’ll have to put up with hills this time). How about you? Are you up for The Kemps 1k challenge? 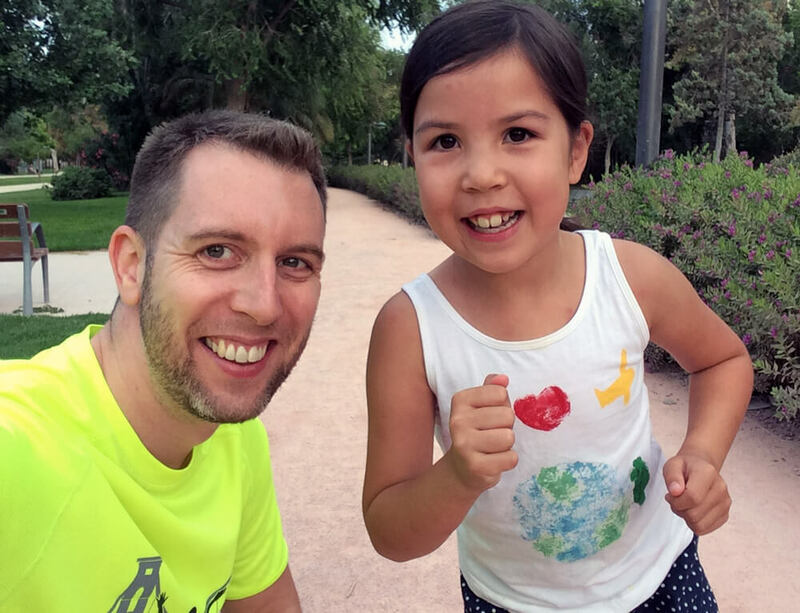 Run 1k with your kids and post the times in the comments below. Let’s encourage each other! I now love running because it makes you feel really happy when you’re on the last 100 metres and you can see the 100 metre sign. 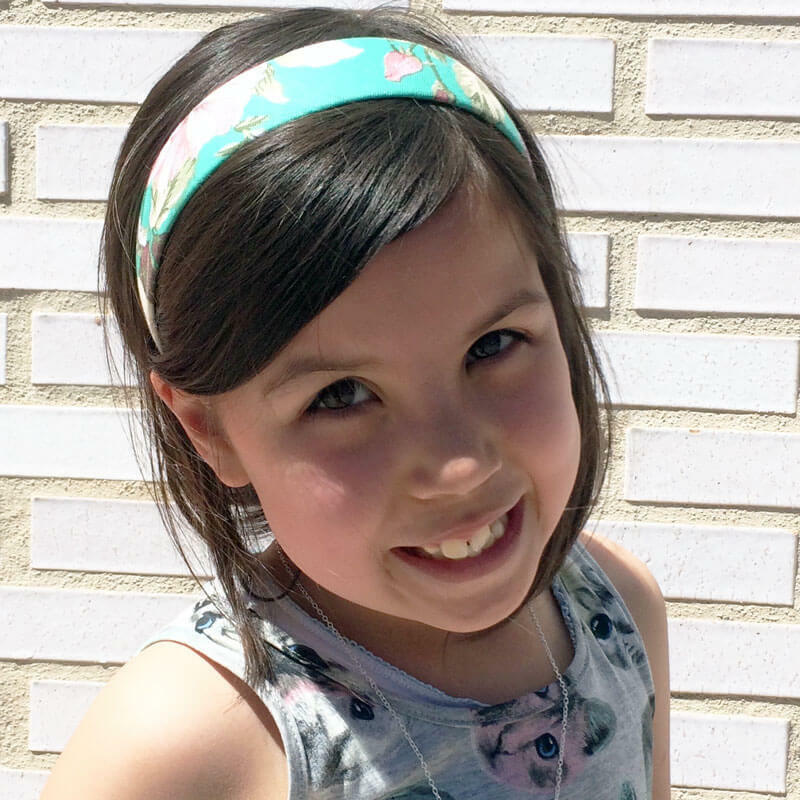 Amazing job Roobs – We loved reading this post and watching the video too!! Aunty Alice, Bethany and I are so proud of you for doing this and even more so because you enjoy and love doing it! I’m sure this is something we will try when Bethany is older too! And maybe we can go out running together as well. Much love from sunny London! Ps. Keep your daddy running! Thanks, but I only did it the first time because of sweets. I think that when Bethany is older she will be a very good runner. Thanks Jay! I bet Bethany could keep up with the dogs at least? Apparently when my dad was little, you used to be a really good runner. I reckon you could of been in the Olympics BACK THEN! What a great idea! I enjoyed this post, especially your daughter’s comments! I can’t run because of my knees but am fascinated by folks that do. Seems like you have a bright and enthusiastic little one there, best of luck with the running! I love that you did that! So great to encourage exercise …. and what a fun dad/daughter bonding time. Thanks Mel – they had a great time together. Amazing girl! It is nice that this is something you can do together. My boys love to run. They recently just completed a kids triathlon (swim, bike, run combination) at 5 and 3 years old. They always amaze me with what they can accomplish when they put their mind to it.